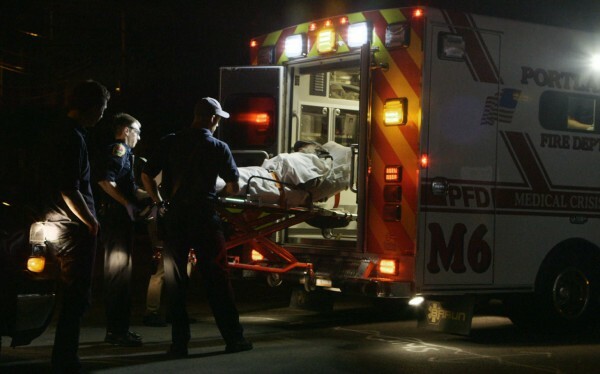 A film team for Al Jazeera America's "Fault Lines" documentary series visited Portland to tape an ambulance team that responds to an opioid-related call nearly every day. When Sebastian Walker traveled to Maine in August to document the drug abuse epidemic, he already knew some sobering statistics. The state has one of the worst rates of opiate addiction in the country. Health care providers in Maine write prescriptions for a commonly abused type of painkiller at the highest rate in the nation. But Walker, a correspondent for Al Jazeera America’s “Fault Lines” documentary series, was still surprised to learn how many individuals began down the dark path to addiction. He interviewed about a dozen recovering heroin addicts at Wellspring, a Bangor addiction counseling program. “Every single one of them had started with painkiller drugs,” Walker said. In an episode of “Fault Lines” airing Saturday night, Walker investigates the controversy over opioid painkillers, some of the most commonly used drugs in America. The U.S. consumes more than 80 percent of the global supply of opioids, drugs including OxyContin and Vicodin. Walker and his team visited Maine in August, at the suggestion of Portlander Sam Black, a producer on the show who viewed Maine’s struggles as a worthy snapshot of a national addiction problem, Walker said. The film team also traveled to Portland to record an ambulance team that responds to an opioid-related call nearly every day. Walker also interviewed a local heroin user, who shoots up on camera. In Kennebunkport, Walker met a woman whose husband got hooked on prescription narcotics after injuring himself at work. He descended into addiction quickly, and their marriage fell apart. The man didn’t fit the popular image of an addict, one the public must rethink to succeed in alleviating the opiate problem, Walker’s investigation found. “It’s still something that doesn’t really seem to permeate the consciousness of Americans … this is such an urgent, urgent problem,” he said. Overdoses from prescription opioid drugs kill more than 17,000 Americans every year — amounting to one overdose death every 30 minutes. In Maine, 176 people died from drug overdoses and related abuse in 2013. Of those, 105 were attributable to prescription opiates and 34 were caused by heroin. State officials have noted that the number of Mainers in treatment for painkiller addiction is now on the decline, thanks to broad efforts to better manage prescribing practices. As deaths related to painkiller addiction mount nationally, federal regulators have greenlighted a new painkiller that’s among the most powerful on the market. The U.S. Food and Drug Administration approved the drug Zohydro in October 2013 despite warnings from the agency’s own panel of experts that the painkiller was prone to abuse. Walker investigated why the FDA approved Zohydro, examining the development as a window into the country’s opiate addiction crisis. His team, which also visited Seattle and Washington, D.C., asks whether federal drug policy favors drug makers’ profits over concerns of public health. Zohydro is the first drug ever cleared for U.S. patients that contains only the opioid hydrocodone, and at a dose five to 10 times higher than Vicodin and similar painkillers that blend hydrocodone with over-the-counter pain relievers such as acetaminophen or ibuprofen. All six New England governors, including Maine Gov. Paul LePage, have urged the U.S. Health and Human Services secretary to reverse the FDA’s approval of Zohydro. Maine U.S. Reps. Mike Michaud and Chellie Pingree also asked the FDA commissioner to reconsider the narcotic’s approval. Zogenix, the company marketing Zohydro, has said it will closely monitor any abuse of the medication, which it believes will help millions of people in chronic pain. The “ Fault Lines” half-hour report on opioids airs on Al Jazeera America at 7 p.m. and 10 p.m. on Saturday, Oct. 25. It will air again on Oct. 26 at 2 a.m. In Bangor, the network airs on Time Warner Channel 210, Dish Channel 215 and DirecTV 357.